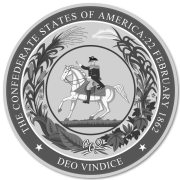 Like most citizens of the Commonwealth of Virginia, J.J. Dunkle of Franklin was no a slave owner or anxious for Virginia to secede from the Union. However, like most residents of the Commonwealth he would not abide the invasion of sister states or his own. As a Captain of the 25th Virginia Infantry, he found himself taken prisoner at Spotsylvania in May 1864. He was subsequently a prisoner of war confined at the Federal prison camp, Fort Delaware. His incredible experience (not that fighting an invading army is not an incredible experience enough) begins as he joins 600 Confederate Officers for a trip into the very bowels of hell. You must read for yourself his words that attempt to describe the intolerable, inhuman and evil treatment endured by he and his compatriots that astonish the bounds of belief. The incredible suffering and sustained infliction of cowardly retribution becomes almost too great to comprehend. Miraculously returning home to a community under foreign military occupation euphemistically called Reconstruction he transcribes his experience under a pseudonym. First published in 1869 in Singer’s Glen, Virginia while the Commonwealth was still under military rule he was indeed taking a chance having it published at all. His story contains no justice, no fair treatment, and no Christian compassion. It is simply one of unbelievable inhuman horror brought to bear upon helpless captives by the self-righteous enforcers of the new Union. Be the first to review “Prison Life – The Miseries and Sufferings of 600 Confederate Prisoners” Click here to cancel reply.